We picked the last of the Pumpkins from the garden today and will have them lining the walkway for any possible trick or treaters that might stop by. We also had a massive beet that got lost in the garden jumble – it had to have been six inches across. I roasted that baby this afternoon so we’ll see if it remained sweet. We also uprooted the rest of the potatoes, turnip, and a couple more acorn squash. Gardening is difficult on my body with AS but it keeps me stretching, bending, and working my muscles plus I love to see things grow! And – I couldn’t do it without Doug. Thank goodness he loves it too! (Watch, he’ll post a comment and say he’s forced into it) LOL! I had such a creative block today. 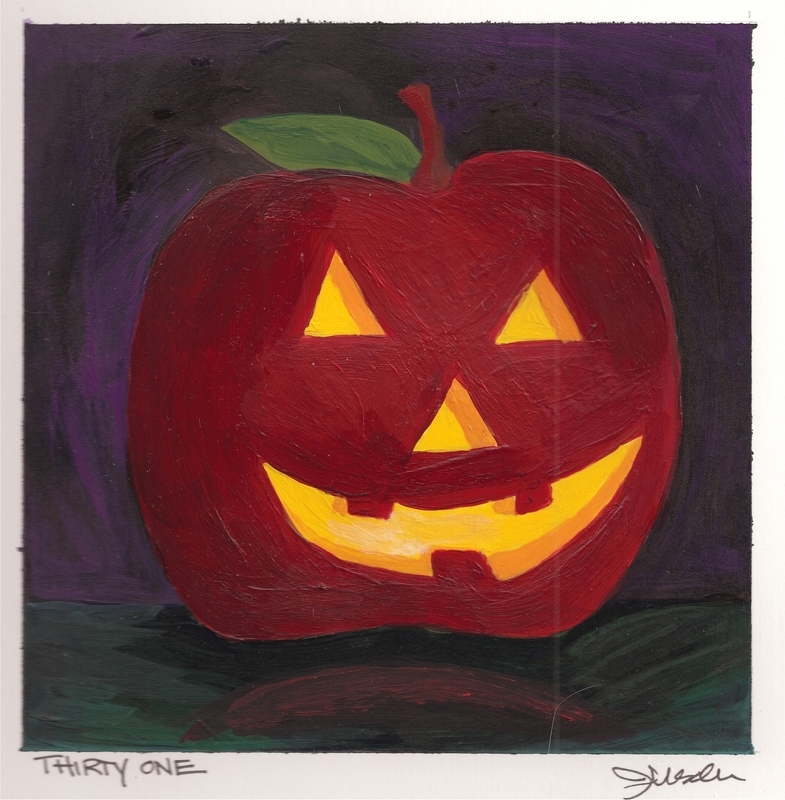 Tomorrow for Halloween I have an Apple o’ Lantern planned but I think I’ve done every conceivable Halloween image possible. At least it seems that way but with 365 days of apples needed, I will be creating Art Apples that are relevant to the calendar, current events and happenings so please humor me with a few more Halloween apples. LOL! Doug was wonderful help to me talking it out and giving suggestions. I thought maybe a caramel apple or a Beetle Juice apple (I would have loved to do a Beetle Juice Apple but I couldn’t face doing a Tim Burton inspired apple and risk not doing it justice.) So… One of my thoughts was to do a skeleton but I couldn’t figure out a good way to incorporate the apple – but my sweet, clever husband came up with a solution. He did however think I should have added some color but I love it just black and white. Hope you do too! Day Thirty was created with archival black ink. Day Twenty nine – Trick or Treat? Halloween is just way more fun with little ones. The sheer joy kids have in asking a simple question where the results are known – and really awesome. 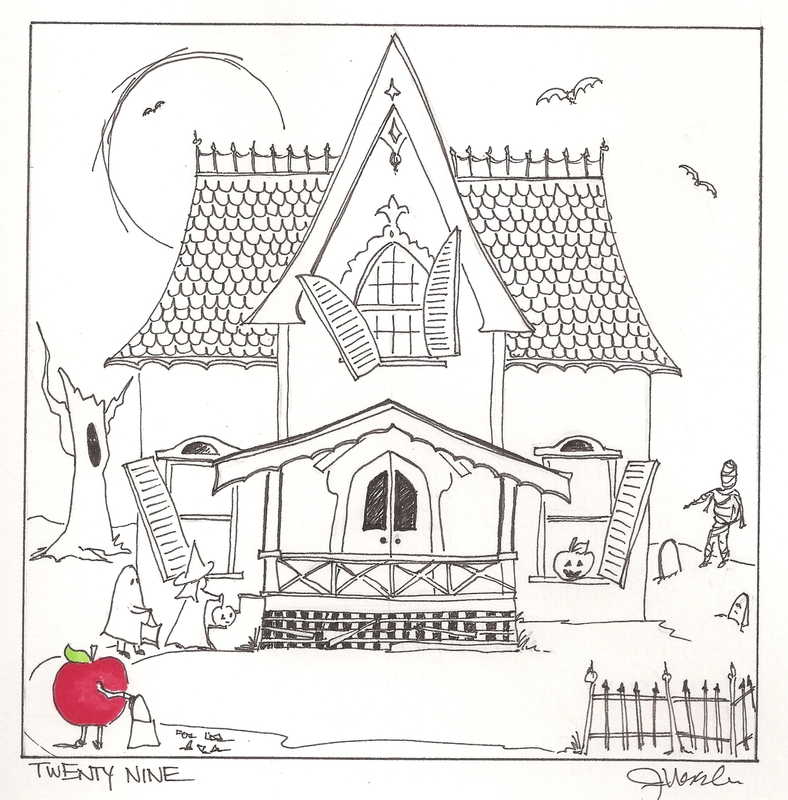 We moved out to the country a few years ago and some Halloween nights (the ones that are bitter cold especially) we get no trick or treaters although the bowl is always full – just in case, right? 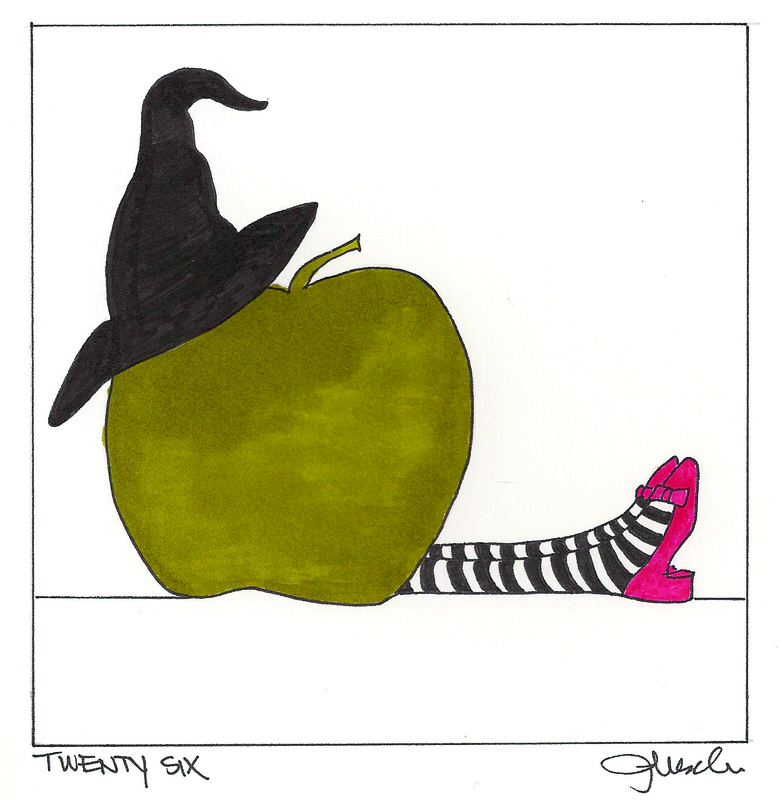 Day 29 is drawn with pen & ink … with a splash of color! 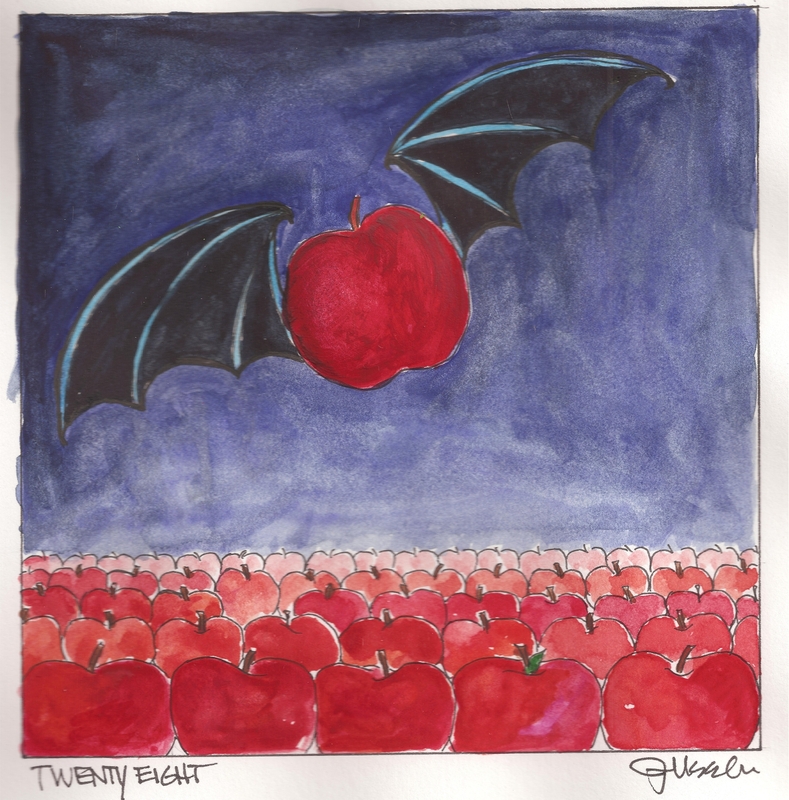 Don’t let One Bat Apple Spoil the Bunch! So really… how do you resist such things? Doug said I should do a bat apple and it all went downhill from there. Puns in my family are just a challenge for another more dreadful and horrible follow up pun. However they are also cherished. And a rare clever pun…. Day 28 is drawn with pen & ink, watercolor and gouache. I’m getting some wonderful ideas for Art Apples and I want to thank you all for the emails. I’ve been keeping a running list and I’m going to keep track of who sent me which ideas. You guys are very clever – I love them so please keep sending them in. Tomorrow I have an apple that I’ve been planning for awhile. Hope you check back in to see it. Make your own Ruby Slippers! The most difficult thing about this process is that I have to produce because I have a deadline. I can’t let any of you down and I WILL NOT let myself down. As an artist the instinct is to keep going and keep going – it will be perfect if I add just a touch of this color here or change that line there. The fact of the matter is that most likely “perfect” was probably 3/4 of the way to what you eventually pronounce done. Most of the time perfect never comes but is more likely to happen from restraint. I love to let some white of the page come through or shade without a smooth blend – it makes it human – and in this world of perfect computerized images – it makes it interesting. So this endeavor is wonderful for developing these skills, sharpening the eye, and evolving as an artist. Since I have to post before the end of the day – everyday – no matter what… I have to go for it and it isn’t easy. Have any of you read Seth Godin? He’s amazing and one of my big inspirations. He speaks of entrepreneurs and business but the ideas hold true here – you have to ship or get nowhere. I choose to ship. Day Twenty four – Halloween Week! This week will be very fun – cuz what’s more fun than Halloween? 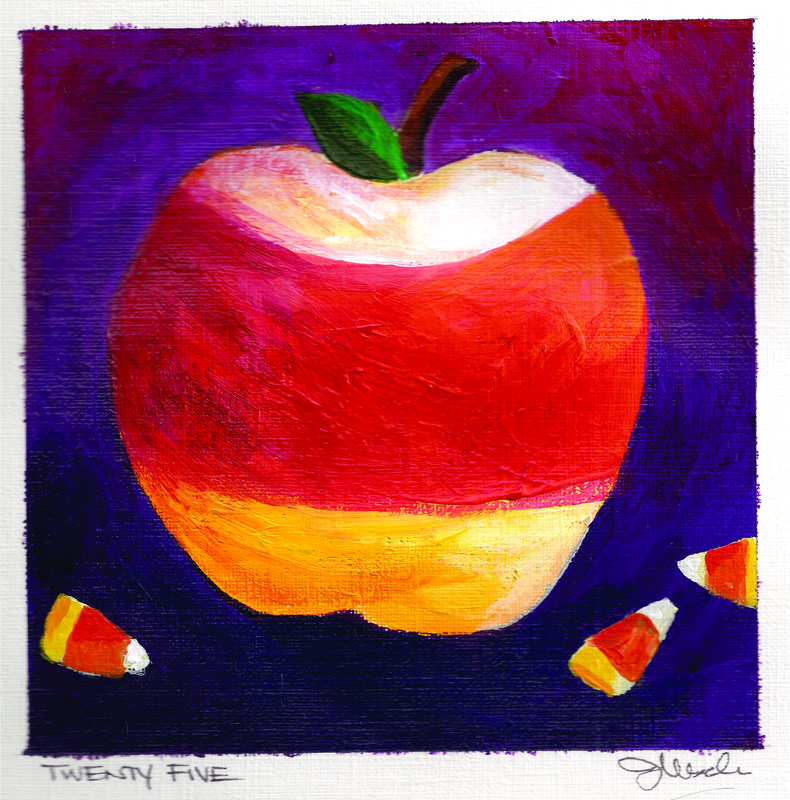 And there might be a few surprises as well – don’t forget… you can sign up via email on the bottom of the page to get an email notice when I post my Art Apple each day. And if this is your first time here, don’t forget to check out the older posts to see all the apples – who knows what day might be your favorite. 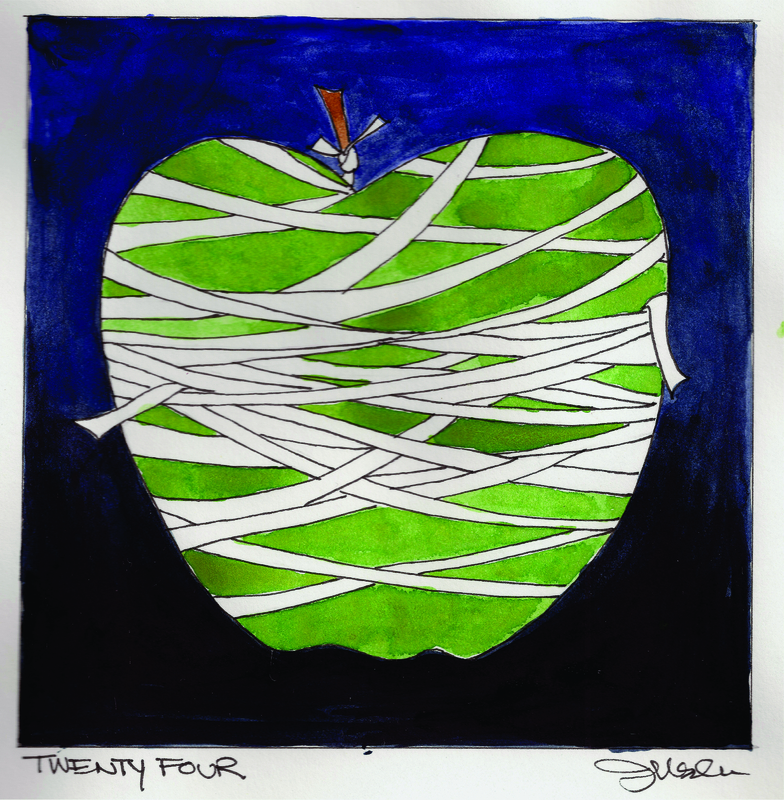 Art Apple A Day – 365 Apples Created Everyday For A Year! Day 365 – Not The End… Just The Beginning!